Beautiful pair of Big Neoclassical style gilt bronze sconces with satin flame-shaped glass from France in the 1960s by Maison Baguès. The wall lights are in excellent condition and the electrical part is in compliance with the US standards. Screw bulb holder 75 watts max. Dimensions: Height 41 cm - 16.14 in Width 10 cm - 3.93 in Depth 13 cm - 5.11 in Backplate 7.5 cm - 2.95 in Glass lampshade: Height 16 cm -6.30 in Width 10 cm - 3.93 in. Since its establishment in 1860, the Maison Baguès has been an emblem of French sophistication in luxury lighting design. Each piece the firm makes is hand assembled using traditional techniques, in order to emphasize the elegance and excellence of their detailed artisanal work. Still the epitome of savoir-faire, Maison Baguès’ luxurious pieces are prized for their craftsmanship, beauty and harmony. The master metalsmith Noël Baguès founded the company as specialists in liturgical bronzes, but by 1880 the company had expanded into the production of bronze light fixtures in response to the development of electrical lighting. Carried on by Noël’s son Eugène and grandsons Victor and Robert, Maison Baguès continued to progress, adding intricately detailed iron lighting collections in the 1920s as well as stair banisters, gates, and accessory tables. Baguès began selling internationally in the interwar period, expanding the company’s operation to New York, Rome and Cairo. Noted for their high end hand crafted work, such as complex carved sconces and hand-strung crystal chandeliers, Maison Baguès appealed to an elite clientele. While Baguès’ Art Deco crystal lighting fixtures drew the most attention, the company was also known for bespoke metalwork that drew commissions from important interior designers and decorating firms such as Maison Jansen and Raymond Subes. The idiosyncratic genius Armand-Albert Rateau used Maison Baguès accessories to decorate the interiors of Jeanne Lanvin’s town home in 1928. Maison Baguès products have also been featured in luxury hotels like Paris's George V, and the Savoy in London. Today, Maison Baguès continues its history of delicate, detailed work and devotes much of its enterprise to preserving the company’s heritage through restoration. Their efforts are worth it. As you will see on these pages, Maison Baguès remains the last word in classic French lighting and metalwork. Superb pair of round Maison Baguès sconces Black paper shades included. Projection to the wall: 8 inches. Wired for US and in working condition. Backplate: 4 inches diameter. 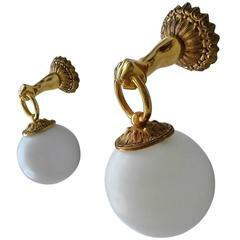 Four sconces from the famous Maison Bagues in Paris, Louis XVI style. The electricity has been fully checked by our team and is suitable for the US. The price is for one sconce. Superb pair of Maison Baguès “ Horse “ sconces 2 lights, 40 watts max bulb per light US Rewired and in working condition Custom backplate available. Measures: Back plate: 4" H, 3" W.